"Though I am content, I don't even know it. I regret my life..."
We have all had our share of bad days: tiring, monotonous, aggrevating, or stretched. On those days, we might feel like the ogre Shrek (voiced by Mike Myers) in Shrek Forever After. 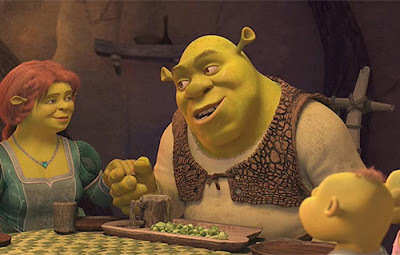 As this film opens, Shrek is overwhelmed by his daily routine, which seemed great at the end of the last movie but now feels exhausting: waking up unexpectedly, having his privacy disrupted, needing to fix some problem somewhere, feeling nothing new or original. This sense of unease can make anyone, ogre or human, feel desperate for an escape... but escape where? to what? and how? Shrek wanted so much to detatch - even if it was just for a little bit - but he never told anyone of his frustration until it all uncorked at his children's birthday party in front of everyone. Even though we (the audience) saw this unfolding, no one around Shrek knew where this sudden explosion came from. With no one else to turn to now, Shrek found the only comfort in the deceptive Rumpelstiltskin (voiced by Walt Dohrn) who fooled the ogre into sacrificing his very soul in exchange for feeling a dose of the old adventurous life before the routine set in. As time goes by in our own work, relationships, or family, things can seem stale like Shrek's life. It can even cause us to abandon the "here and now" for the "what if?" - wondering if the grass is greener on the other side. Like Job in the Hebrew Scriptures, we might tempt fate by wondering, "Though I am content, I don't even know it. I regret my life." (Job 9:21). While this reaction to the monotony or the angst of life can be natural, if left unchecked or unattended, it might lead to broken friendships, poor work ethics, unfinished business, or even divorce and rejection. If we let the frustrations burrow under our skin - and never really tell anyone (especially those most dear to us), disaster can strike. Like Shrek, we need to realize that our lives are and have always been an adventure, no matter how dry, boring, or horrible it might seem on a daily basis. The grass is just as green on both sides of any situation - and thanks to the relationships we have carved out in our life, the work we have thus far accomplished, and the gifts and graces God has already blessed us with - it's actually even greener on this side. But without communication, without talking to those who walk along us in the daily routine, the adventure might be lost. While dreaming of alternate universes we might escape to might seem fun, the isolating solitude within our own head can be the biggest antitode to our own adventure. Shrek had to learn this the hard way - and only an "escape clause" in the contract with Rumpelstiltskin could get him out of trouble. For us, our "escape clause" is our relationship with God and with those God has placed in our lives. In fact, if escape is what we desire most, perhaps opening up to God in prayer as well as to others around us in conversation can lead to our next new adventure. Communication is truly the best medicine to the mundane or the anxiety-ridden. That's what brought Job out of his misery; that's what Shrek had to discover in his alternate universe; and that's what all of us can do if we ever find ourselves feeling stuck in an ogre's mud pool thinking "I regret my life..." When we open up like that - to God and to one another - then we can live the adventure forever after - just like we always wanted. What a delightful post !! I have not seen the latest Shrek but this is a great review and what you say here relates so wellto what some people go through. It also links nicely to this Sunday's gospel of Martha and Mary. Shrek's dilemma reminds me of Martha's jaded feelings at the mundane tasks of serving!! Thankyou for this and blessings.